Since I couldn't use my camera, I used my mobile - Samsung S3. Previously Mr.CZ's, coz I was using Nokia Lumia 820, which I no likey. We swapped, sadly not before he dropped it on a marble floor and cracked the screen. I wanted it anyways, coz that Windows phone was driving me crazy. My Camera: Sony Cybershot DSC-HX7V. When I'd gone shopping for a new camera (after my Panasonic Lumix got stolen along with my handbag), I picked this over 2 DSLR's - Canon EOS-something & Nikon-something. Reason: It's smaller & lighter than the 2. 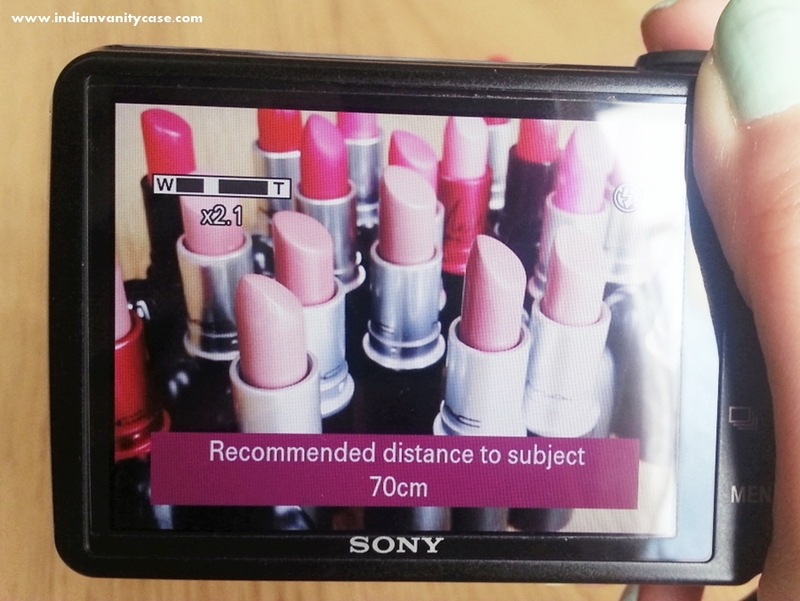 It's simply more convenient & fits in my small handbag too. Main Features: 10x Optical Zoom, 16.2 megapixel sensor, 3D images, Full HD Movie. I really don't know the rest. So, let me show you how I set it and everything. It gets easier when you get to know your camera, and play with different features. *Please excuse me if I use the wrong words to describe anything. 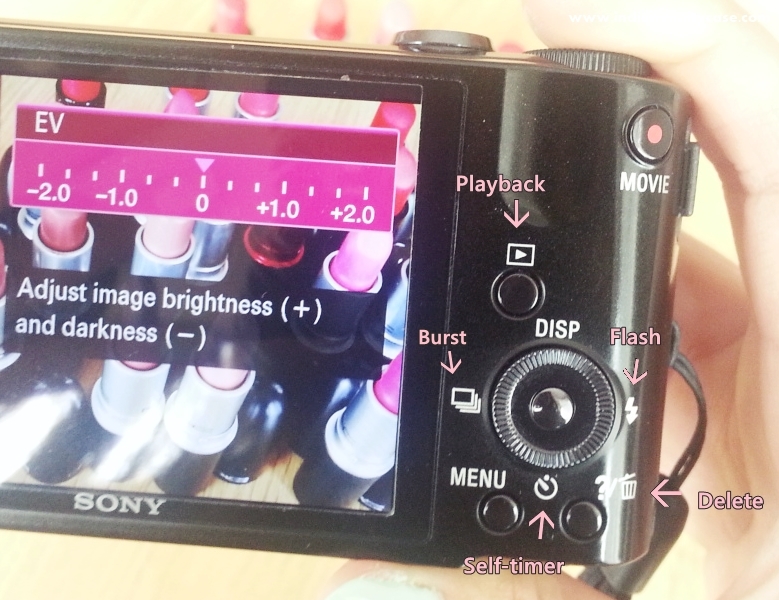 Step 1: Setting the shooting mode. I usually use the P (Auto Exposure With Adjustable Settings) and the person icon. Most of the time, the person icon, which is Shoot With Background Defocus. Step 3: I go to EV button- brightness setting. This is the one thing I adjust every time I click photos. Most of the time, I set it to one point higher than the default. I'll go up to +1.0 if I'm clicking in the evening. 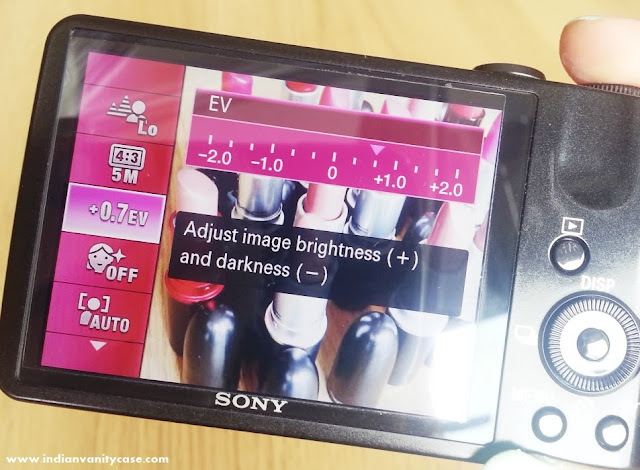 If your photo is coming out too dark, make sure you check this setting. That face icon below EV is Soft Skin. Just makes your skin look somewhat airbrushed. I used it once or twice, but I don't like how fake my skin looked. Step 4: Zoom in! This will increase the lens and make objects look magnified. If you're zooming, and the objects look blurry, that means you're zooming in too much, so you need to Zoom Out till the point it looks normal again. Bring your camera closer to the objects if you think it looks too far, and can't zoom in anymore. I learnt how fantastic this feature is when I was taking pics of my Jewelry Holder. Step 5: Now your finger is itching to press that final button, but NOT YET! This is an important step, especially for digital cameras (I don't know about DSLRs). Don't click immediately. First, lightly press the click button about half way down- you'll see those bracket things. 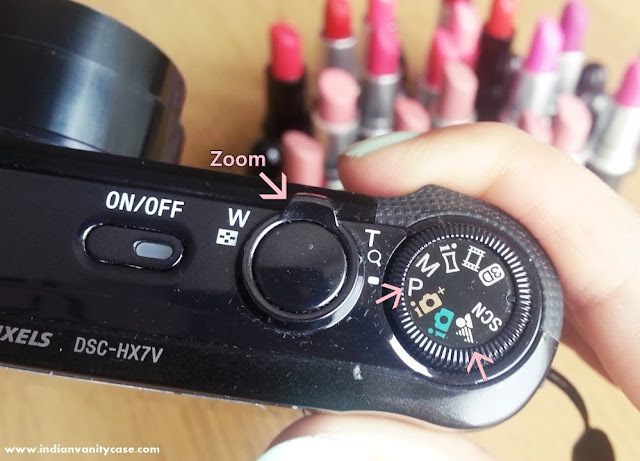 Doing this will help the lens (?) focus on objects properly, and prevent blurry images. Press lightly once or multiple times, and when the objects look crystal clear, press down fully & CLICK! I set mine on Auto Focus/Face Detection- You'll find this in Menu, under Soft Skin setting. 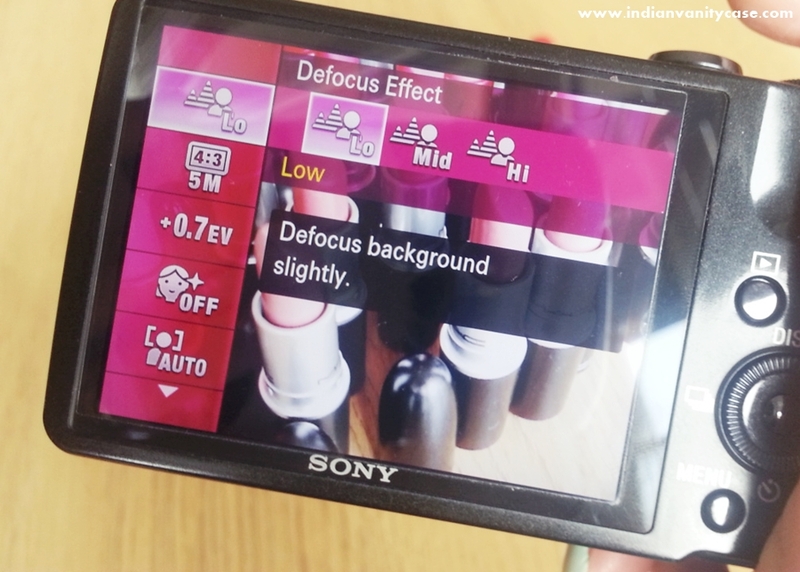 If your camera doesn't already have a background defocus mode, doing this will give almost the same effect. In some cameras. like my Panasonic Lumix, there's Macro setting- a flower icon. It's best for extreme closeup photos and small objects, like small insects. For beauty bloggers, makeup swatches. Self-timer ~ If you're taking photos of yourself, this is the way to go. I use it for all my LOTD's. 10 seconds. Flash ~ I don't like to use it. Useful only at night, and when you want to show shimmer in makeup. Menu: You click here to view all the previous settings we talked about. These are most of my MAC Lipsticks in black packaging. I ALWAYS click in natural light, next to my big living room window, which is the brightest place in the whole house. No soft boxes, no flash. 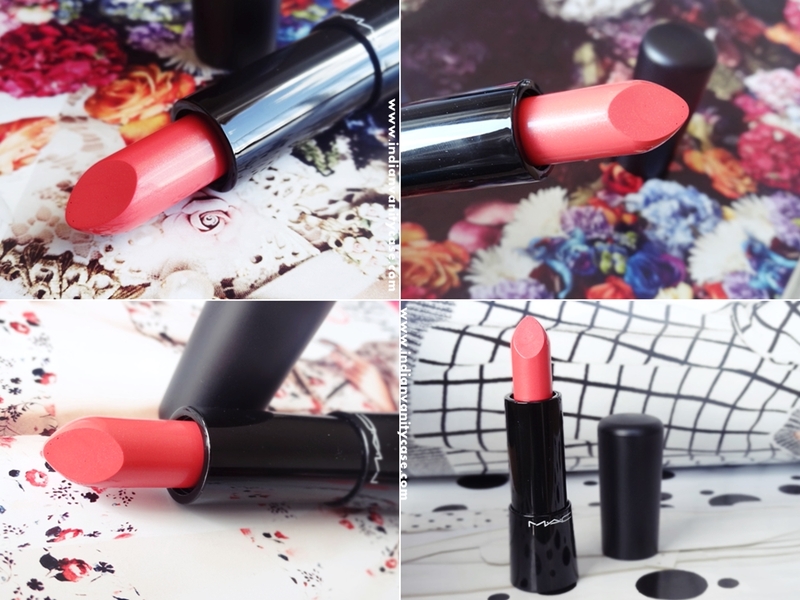 In the pics above is MAC Style Surge Mineralize Lipstick. Clicked with different backgrounds. Pics and swatches taken in May, but I never posted them on here- mainly coz I did not like the lipstick. That's just 4 pics from a folder of over 30 pics. That's all for today. Hope you found this post helpful & I would really really love to know which camera you use. Great post! Love to read all the Tips for bloggers. Loved it! I have the Canon EOS Rebel t5i. It's the latest one form Canon and I LOVE it! I don't know if it's available in India though because up until last month the latest they had was 60D. Thank you so much for sharing your tips with us I'll treasure them! Very helpful tips! I use a Canon Rebel T3i and I love it! Great post Cynthia! I use Canon 1100D camera and have been loving it. 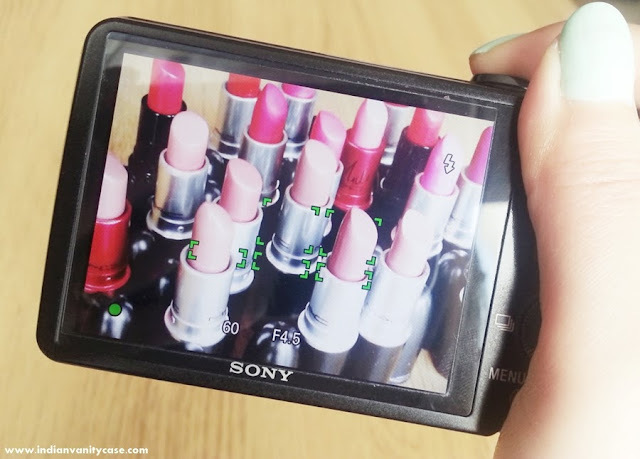 Canon is known for capturing colors much more better then the other brands and that's seems more important when considering we play with colors all the time in the beauty blogging world ^_^. P.S: I recently bought Nikon Coolpix P520. Its a 18.1 mega pixel camera with 40x zoom! 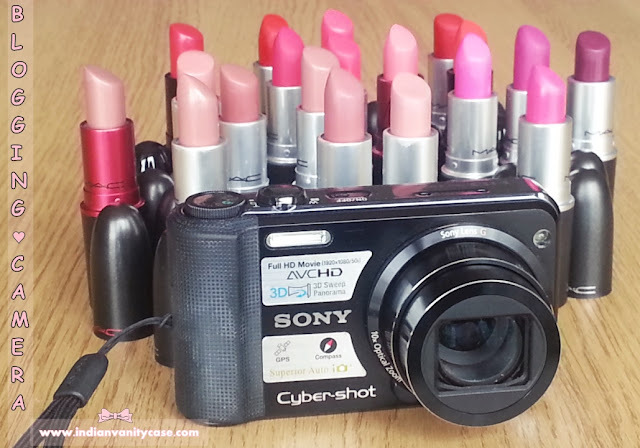 I mainly bought it cause I started with beauty blogging recently and my old coolpix never captured swatches properly. But I am still learning how to use this one, it seems to capture EVERY bloody tinniest spot on my face and I have to spend a LOT of time editing it out! Ugh. Well, I loved the adjust brightness idea you shared! I have never tried those, I usually only play with scenes. i love ur writing style !! so witty n funny!! these DSLR's n settings are too confusing for me!! f you buy one please give a tutorial like this ..basics are enough!! Wow this article was for too technical but easy to understand. Way to go CZ! I usually just use my Phone for the pictures on my blog and they turn out pretty great without all the fussy camera settings you wold need in a proper camera. very informative post for us.. btw ur camera costs??? Ganz toller Artikel, bei dir schaue ich immer ganz gerne vorbei. Very helpful tips for a newbie like me. Love. This is really helpful, I'm looking for a new camera for my blog. Although my iPhone is doing pretty good job, I want something that I have a little more control over!